Somehow, it seems fitting that where Benjamin Button grew younger with time, we enjoyed the beach version of a drive-in movie, complete with vintage commercials and Ben and Jerry cartoons. Smallest of the USVI, at only 2½ miles long and 1 mile wide, Water Island, is a sweetly twisted picture of nostalgia, the Leave It to Beaver version, not the Disney-fied version. 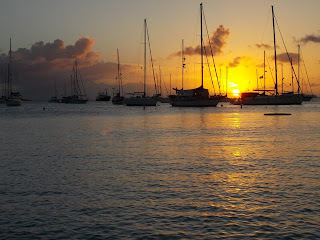 It’s the quieter side of the US Virgin Islands (USVI), accessible only by boat, a mere ½ mile from St. Thomas, where 1.2 million cruise ship passengers land annually, and the two biggest cruise ships in the world, Oasis of the Seas and Allure of the Seas, regularly dock. Water Island does not have taxis, public transportation, gas stations, hotels, shops or a main town. Outside a simple a beach bar and outdoor beach BBQ Honeymoon Bay, there are no restaurants. Hard to believe it’s the same site mobbed by hordes of young, buff spring breakers the previous night, but that’s another post. Water Island’s Honeymoon Beach is an idyllic spot, clear water, gently sloped powerdery-soft sand beach, fringed with picture-perfect coconut palms, rumored to be planted by the Benjamin Button movie crew. Easily 20 sailboats were tucked into this small bay when we dinghied in. It’s a wonderful place to enjoy the beach, hiking, sunsets over the water and … Monday Movie Night! 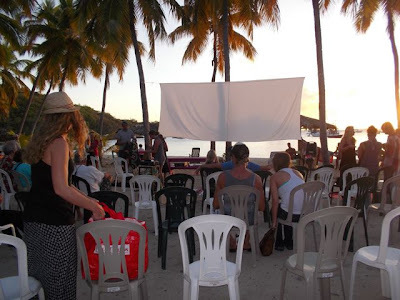 While Parental Guidance isn’t something we’d rush to the theaters and open our wallets to see, it was perfect for free family-friendly Monday Movie Night on the beach. It was fun seeing Bette Midler back on screen, in this role as a subtle drama queen grammy. The screen was a sheet stretched between two palm trees. 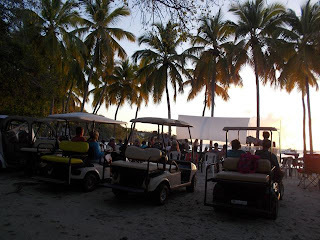 Chairs were plastic stackables, set up in a semicircle, with locals lining the front with blankets, beach towels and the rear with… golf carts! Golf carts are the primary transportation on Water Island, and they’re everywhere. Just like a drive-in, only better! Of course, no movie “theater” would be complete without popcorn, and the movie sponsors sold that, burgers and more. We watched the sun set, settled into our comfy chairs-in-a-bag, deeted ourselves up (sigh… there are mosquitos and no-see-ums in paradise, too), dug out feet into the sand, and enjoyed. Who needs high fidelity sound and 3-D effects when you’re on a Caribbean beach with the local friendly community? The best part isn’t watching what’s on the screen; it’s just being there. Honeymoon Bay… a popular spot for cruisers. Water Island will remain a fond memory long after the grains of sand we brought with us are swept away. I just found your blog. I am so glad to see this post about Honeymoon Beach. In December my husband and I chartered with Fury Charters and renewed our vows. What we told the Captain was he could go anywhere he thought would be nice. He anchored off of Honeymoon Beach for the ceremony and told us about the movie nights. We saw a few sea turtles as well. Christina Oesterwind what a lovely and appropriate spot to renew your vows! What movie did you see (if you remember)? Yes, it's nice to see sea turtles; sign of clean water and a healthy ecosystem. Oh, and they're cute in a quirky way, too. About a week ago we notice dolphins in Gregory Channel. the swift running ocean stream between Water and St. Thomas Islands. I was excited -- it had been a while since I've seen them sailing. FYI -- wil be doing another post on Water Island soon.